The Quatuor Tana, whom I last saw playing Gabriel Jackson & John Taverner at the Vale of Glamorgan Festival in 2014 (see my review), is playing at Conway Hall this Sunday (22 November, 6.30pm) in their Sunday Concerts programme. The quartet is playing an interesting programme of quartets from different 19th & 20th century traditions, with Arriaga's Quartet No.1 in D minor (Spanish/Basque), Shostakovich's Quartet No.8 in C minor Op.110 (Russian), Turina's La Oración Del Torero (Spanish) and Dvořák's Quartet in F Op.96 ‘American’ (Czech). I will be giving the pre-concert talk for the event, so come along at 5.30pm to hear my talk Composing on the periphery. 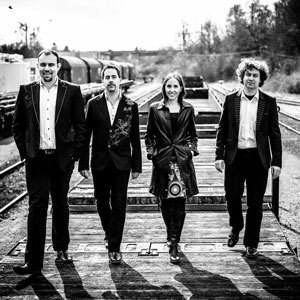 Based in Belgium, Quatuor Tana was formed in 2010 to promote contemporary chamber music repertoire. The quartet places no boundaries when selecting style or genre and often presents classical repertoire alongside contemporary works.